Stéphanie and François are happy to welcome you to « La Petite Maison » located in the heart of Cannes but away from the noisy buzz of the city. At « La Petite Maison », you will be a few steps away from La Croisette and its Palais of Festivals and within few minutes you will be walking along the Cannes’ famous sandy beaches surrounded by the Esterel mountains. After just a 5 minutes walk you will access rue d’Antibes, our famous shopping district. Walk a little bit further and you will stroll in the old town of Cannes, Le Suquet and its harbour, so typical of the French Riviera. Quietly nestled between the beaches & the mountains, Cannes, known throughout the world represents the essence of the French Riviera — the art & culture of the big city & the heart & hospitality of a small, coastal town. Cannes is truly a magnificent place to live or visit! Whether you’re looking for a place to play, vacation, visit, or a place to do business, Cannes has it all! The architecture of our house is typical of the city : a mix of provencal and Italian influence. 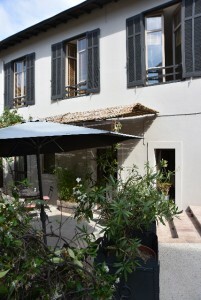 « La Petite Maison » overlooks a charming city garden and is totally independant from our house located just next to it. Our decoration offers you the perfect blend of intimacy, timeless elegance with contemporary materials and authentic elements originally present in the house « La Petite Maison ». Three sober and elegant bedrooms accentuated by soft browns and greens are waiting for you, each with its own private bathroom. A warm and cosy kitchen invites you to sit around and have a coffee while reading our regional guides and brochures. When the sun is out, which is quite commun in our region, you will enjoy our terrace. Welcome home ! Stéphanie and François.